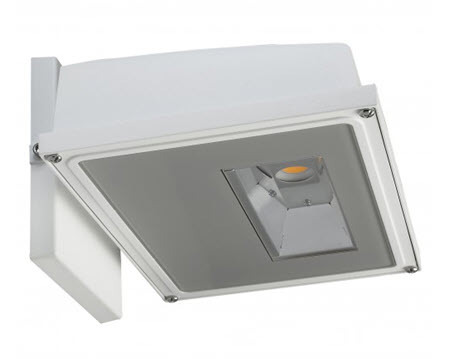 SATCO LED square large wall pack light fixture with 30 watts and white finish for many types of security and general lighting needs. It's low price, and unique shape makes it perfect as an HID replacement. Many people like the instant-on capability of the LED lamps, and the heavy-duty construction for years of service. The fully tempered lens protects the LED array, and it helps distribute the light while providing a certain amount of visual comfort, reducing glare. It has a one-piece die-cast aluminum housing and hinged, removable die-cast aluminum door. For people that need just a smaller amount of light for some security or general area lighting, this might be a good solution. It's not going to blind you with too much a light in an area when all that is required is something fewer. This only consumes 30 watts and replaces up to a 150-watt metal halide light making it the perfect size for entryways, apartment buildings, condominiums or office buildings that have exits that need a localized light. This would also be a good choice for somebody's home where you need the security of lighting that can be on all night or however long you choose. - Choice of 3000K or 4000K. - 3000K dark sky certified. - Replaces up to 150 watts HID. - Dimension: W = 9 13/16 D = 7 7/8 E = 5 inches. - Aluminum diecast housing and frame. We spent weeks trying to find a safety light that would both meet our needs and comply with Monterey County's strict version of "dark skies" regulations. After looking around on-line and calling multiple manufacturers with no success, we found BuyLightFixtures.com and connected with John, the owner. He was very helpful and went out of his way to research options that would work for our unique situation. John found one that worked... then reached back out to say he'd found another one that also worked... and was cheaper! We got a great solution at a great price and had a wonderful customer service experience. Needless to say, next time we need lighting, BuyLightFixtures.com will be the first place we look!